← Have you seen this pattern? Today, I got to play with the Singer New Family/Model 12 at the Marr Residence. 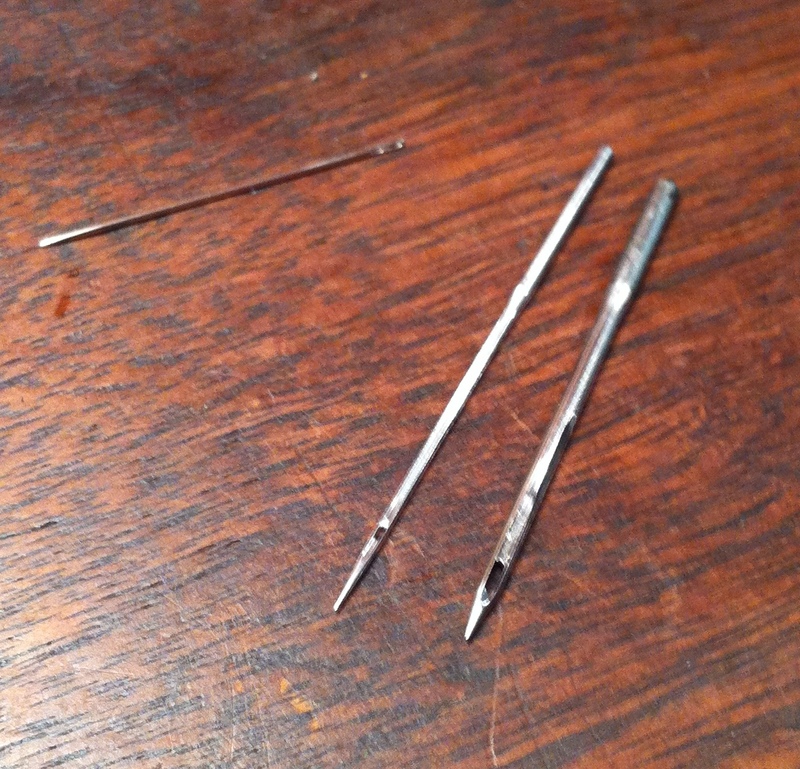 I’ve poked at it a couple of times before, but today I finally had needles, courtesy of The Treadle Lady. Just for reference, the needle in the middle is the proper needle for a Model 12. The needle on the right is the one that was in the machine. Yikes. Shorter and with a much fatter base (with a flat shank, when the proper needle has a round shank), it was also about as broad as a tree trunk, and as sharp. Needless to say, it was a much happier machine with the proper needle in. The horrific skipped stitches vanished pretty much almost immediately. Several other issues did not. The biggest one is the tension. Model 12s have the stupidest most primitive shuttle I’ve ever seen. The bobbin thread tension is controlled by poking the thread through a variable number of holes. Unfortunately, even the least number of hole-threading manageable seems to be too many, as the tension appears to be too high for the needle thread. Teeny little loops of thread on the underside. The situation did not improve significantly when I discovered that there was ANOTHER hole on the shuttle, forward of the other three, which was clogged completely with crud. I’m also having trouble winding the bobbin smoothly, so I don’t think that helps, either. I’m not quite sure how to adjust the top tension, either—although perhaps I need to take the front off the head and see if it can be adjusted from the inside. That scares me, though, because a bunch of stuff is connected to the part that comes off and it shifts alarmingly when you take it off. The belt is slipping. I shortened it a bit, but it’s still slipping, so I guess more shortening is in order. This, too, is scary. On the other hand, it actually sews. 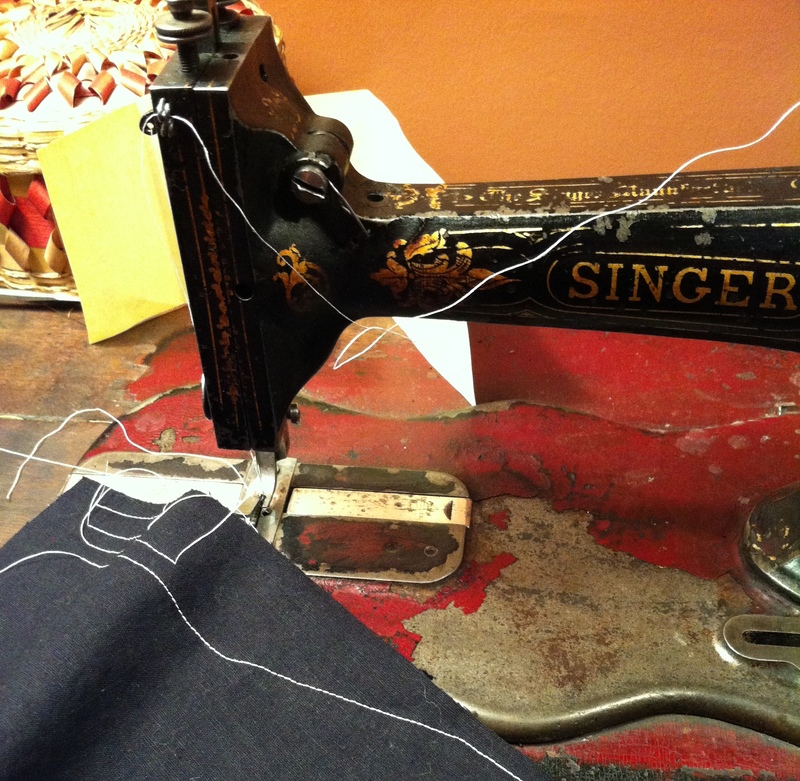 Possibly related to the slipping belt, but I find the machine hard to treadle smoothly. It tends to klonk and reverse itself after a few treadles, especially as I try to go faster. There doesn’t quite seem to be the kind of easy rocking motion I am used to in other treadles (not that I am a particularly adept treadler, either). I’m not sure if this is just a feature of the more primitive mechanism, or if there’s anything actually wrong. At least it’s not squealing every motion anymore. I have oiled the snot out of it. And, possibly worst, I can’t find a serial number to date it! It should, apparently, be on the bed at the base of the pillar. Probably right under all that red paint. /sigh. On the up side, this machine probably hasn’t actually been used in my lifetime, and is almost certainly well over a century old (the Model 12s were produced from the 1860s to 1902). The stitch will be gorgeous if I can just get that damned tension right. I mean, even if I can’t, it’ll be awesome to have it usable for little demos, but wouldn’t it be grand to actually sew, oh, I dunno, my drawers on it? Waw! Looks great. Good luck with trying to get the tension right. Must be such a pleasure to work with. 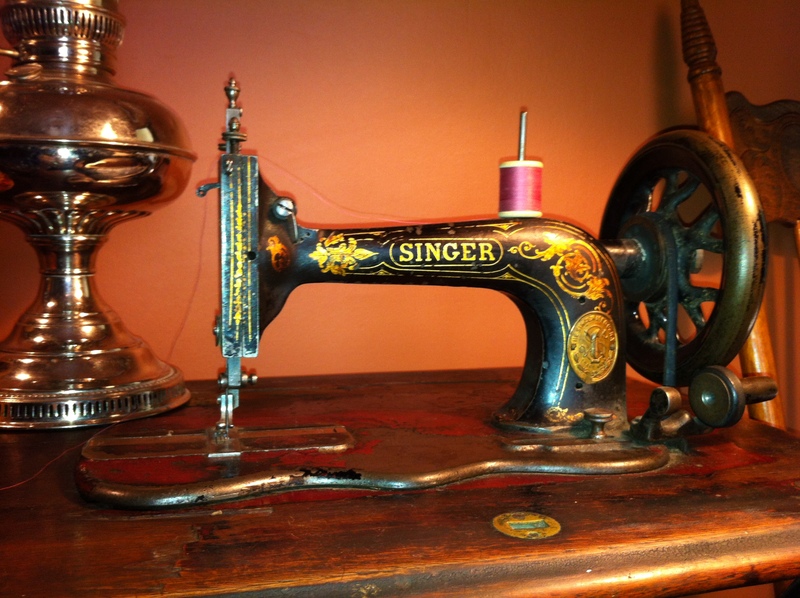 My friend has an old Singer (not as old as yours though) and she was having trouble with the top thread breaking. She took it to my repair guy and all she needed were some nice German needles! Amazing how much of a difference the right kind of needle makes, especially in those old machines! I’ve never seen one as wide as the one that was in your machine- yikes! Good luck getting her working again! 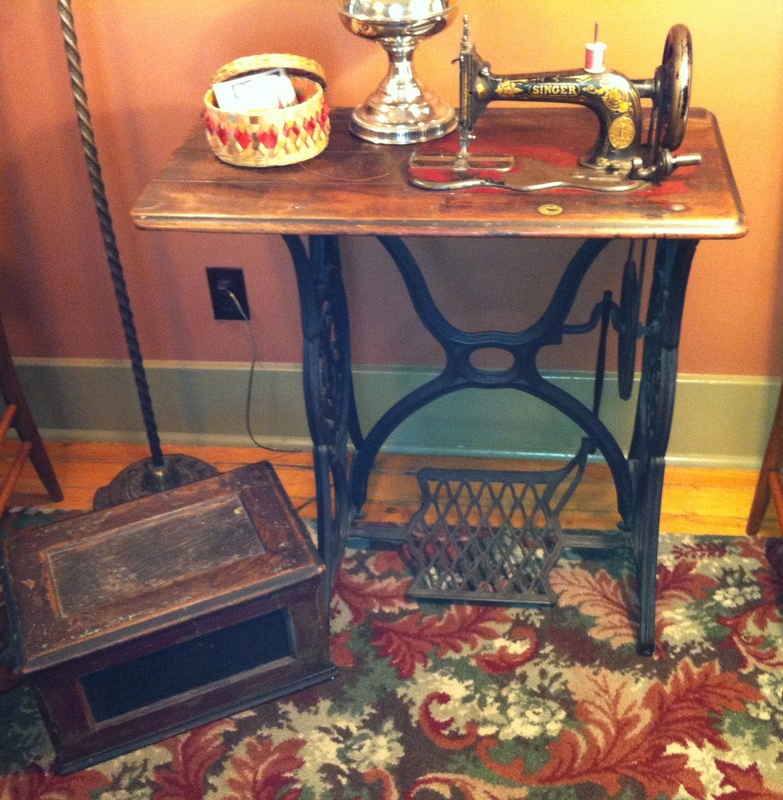 I’ve never had a chance to try a treadle machine – but they appear fascinating. does it sew an anna??? Those needles look pretty crazy. That thick one looks more suited to needle point or darning than a sewing machine. My 1876 Singer has the serial number just in front of the small knob that sits below the oval gold medallion. No, I don’t sew with it, I love my Janome too much. You might check out this site/blog she does all sorts of machine repairs etc…. treadles included (she really seems to love them). Bet she could tell you what you might need to do. Just a thought. Ok, here’s a shot at your top tension location. It appears to be on the front, that screw facing you on top left. I think you have to adjust it with a flat blade screwdriver. Hope it does the trick!